Keeping the safety and security of your residents at the height of importance, our Dementia Sign Personalised Bedroom is a great tool to have around your care home. These boldly coloured green and blue signs have been made from a high-grade rigid plastic coated board that is easy to wipe clean and can be affixed to any wall or door with your choice of adhesive. 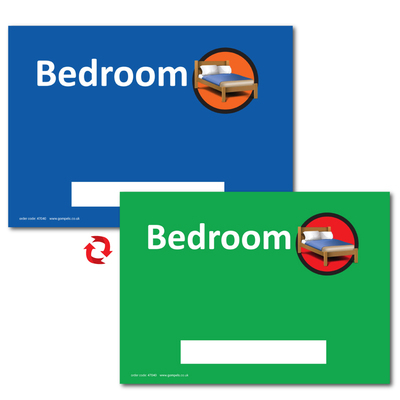 Each sign has easy-to-read text with a clear image of a bed and a writeable square where the resident's name can be written. This enables your more vulnerable residents to recognise their own personal space when walking around your facility. Ensure you are effectively catering for all the requirements of your residents with these simple but functional dementia signs. Our wall signs are easily fixed to walls or doors using the Sellotape Sticky Fixers Outdoor 48PK and can be protected from damage using our Black Sign Holder A5.